Last month, reliable tipster Evan Blass (@evleaks) revealed the upcoming HTC Harmony will be launched as HTC U11 EYEs. Then there were reports that the device has also received 3C certification in China. And now, the company has confirmed the unveiling date for the handset. 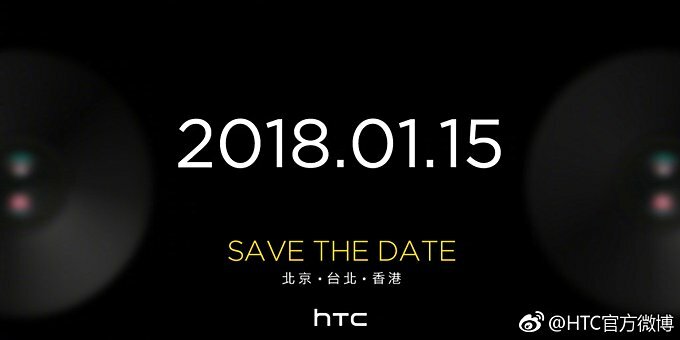 Through its Weibo account, HTC shared a 'save the date' invite which reveals January 15 as the date. While the poster itself doesn't contain the device name, the post accompanying it does mention 'Eye,' effectively confirming that the HTC U11 EYEs will be the star of the event. The handset is said to come in two variants, one powered by Snapdragon 652, while the other by Snapdragon 660. These models will come with 4GB/64GB and 6GB/128GB memory configurations, respectively. As for other key specs, there's a 5.99-inch 18:9 aspect ratio display with 2160 x 1080 pixel resolution, a 5MP dual camera setup, and a 12MP main shooter. It's rumored to pack in a 3,930mAh battery. Reports say Hong Kong, China, and Taiwan will be the first markets to get the phone. Yeah, I found a LG G5 SE in UAE though... Xiaomi Mi Note 3 is available mostly on Asia, Middle East. They told that they will release the phone to US when they get a store running on US. Oppo R11s and Vivo X20 Plus is China-exclusive. You know, 90% of the phone you said is not even widely available and mostly focus in China market. Even LG is a rarity. Isnt that LG G5 SE version is only for Brazil? Lol. Admit it. SD652 is super rare.